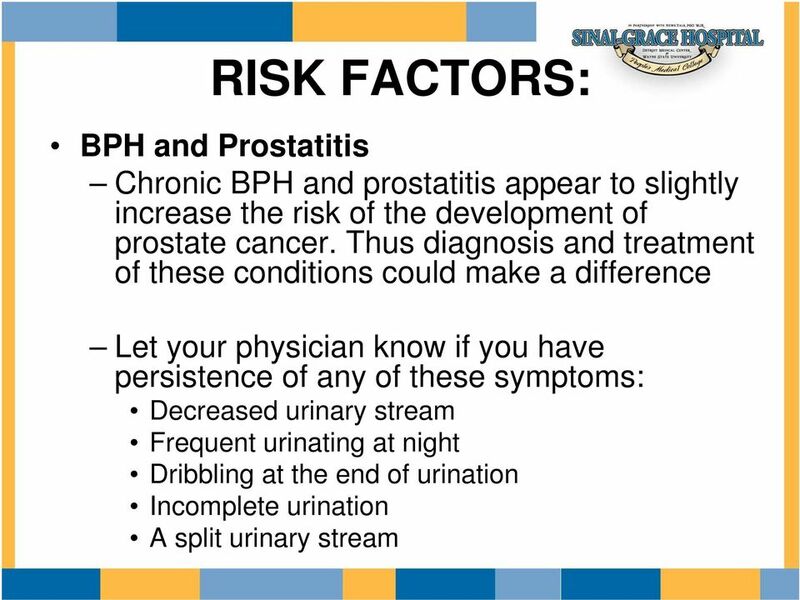 Download "THINGS TO BE AWARE OF ABOUT PROSTATE AND LUNG CANCER. 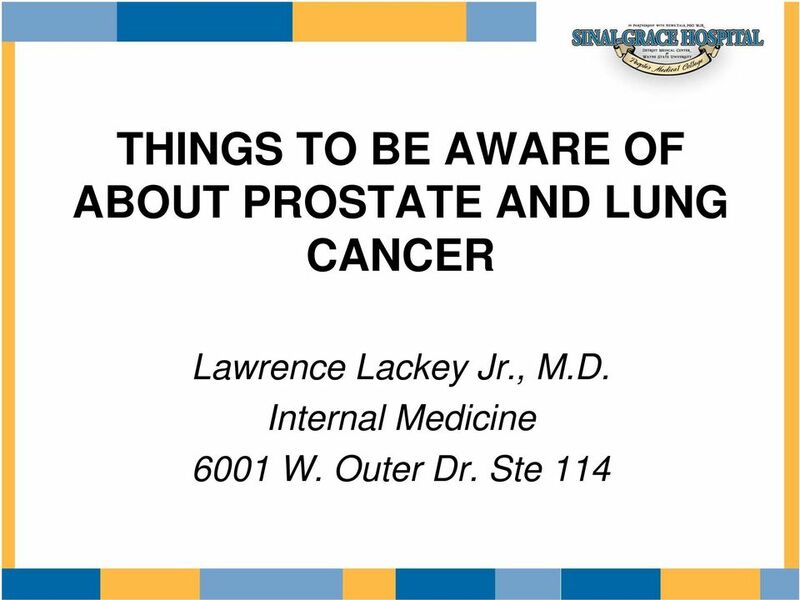 Lawrence Lackey Jr., M.D. 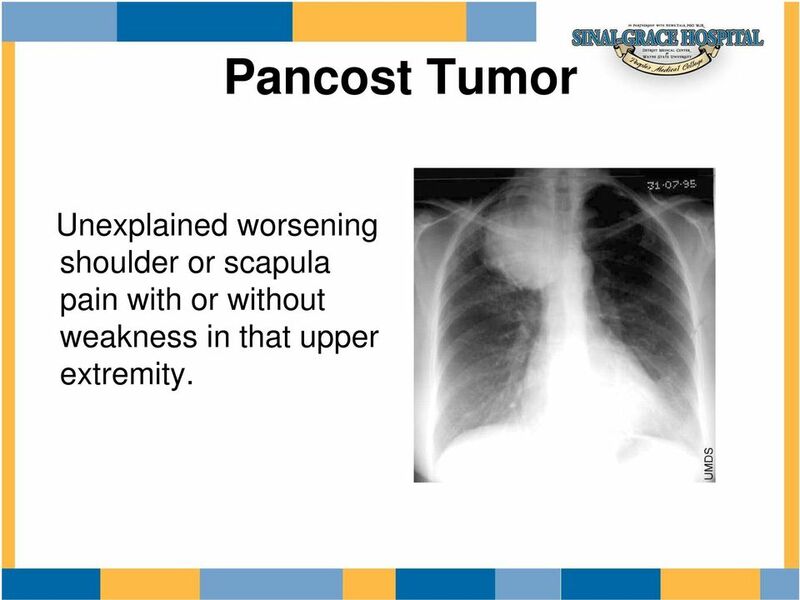 Internal Medicine 6001 W. Outer Dr. Ste 114"
2 WHAT IS CANCER? The body is made up of hundreds of millions of living cells. Normal body cells grow, divide, and die in an orderly fashion. During the early years of a person's life, normal cells divide faster to allow the person to grow. After the person becomes an adult, most cells divide only to replace worn-out or dying cells or to repair injuries. 3 WHAT IS CANCER? 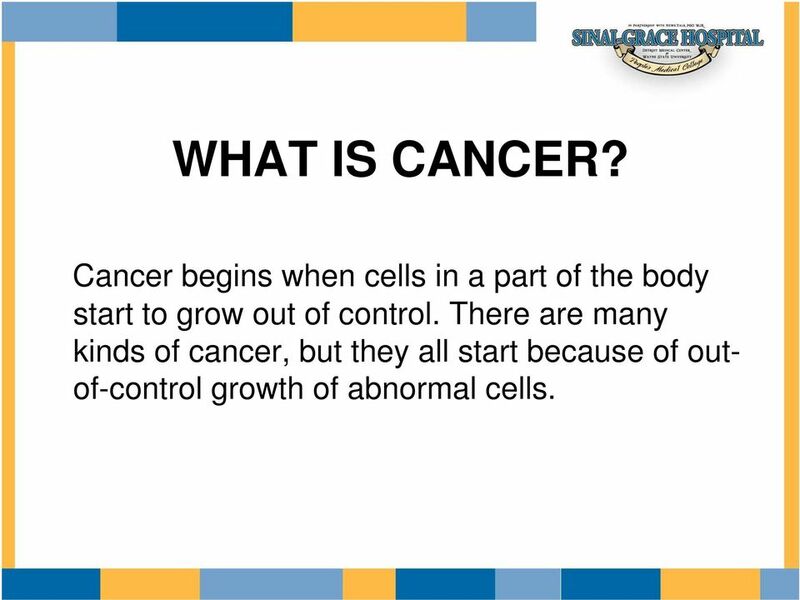 Cancer begins when cells in a part of the body start to grow out of control. There are many kinds of cancer, but they all start because of outof-control growth of abnormal cells. 4 WHAT IS CANCER? 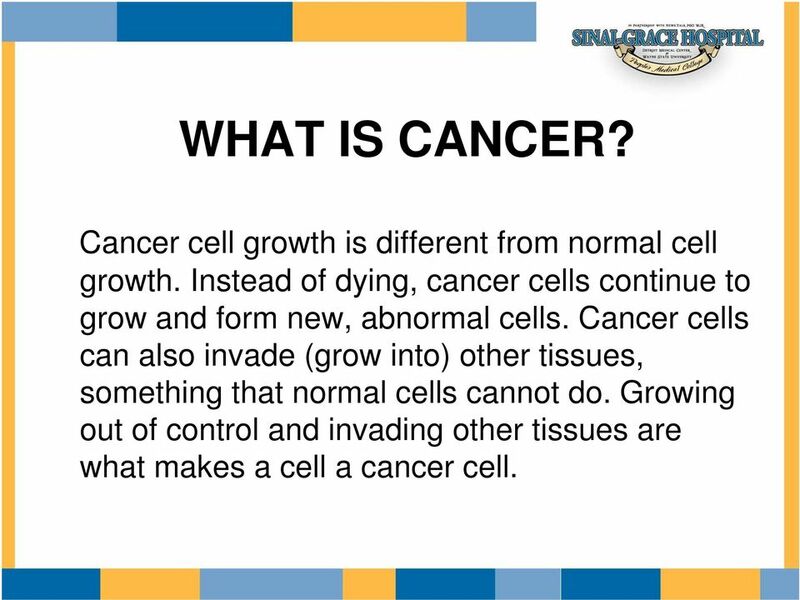 Cancer cell growth is different from normal cell growth. Instead of dying, cancer cells continue to grow and form new, abnormal cells. Cancer cells can also invade (grow into) other tissues, something that normal cells cannot do. 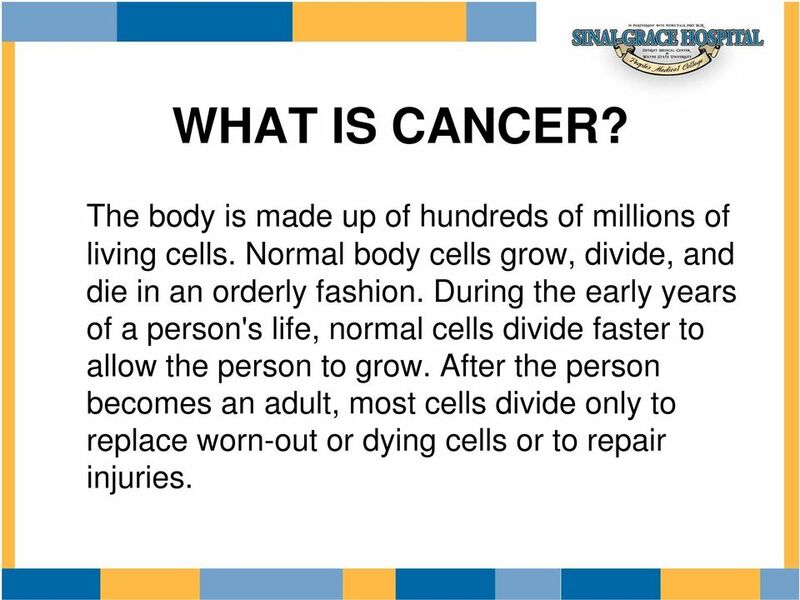 Growing out of control and invading other tissues are what makes a cell a cancer cell. 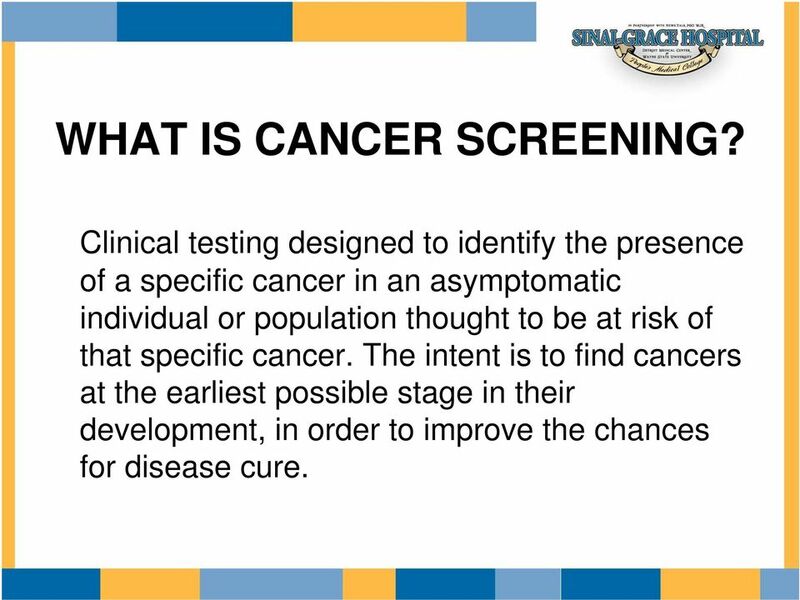 5 WHAT IS CANCER SCREENING? Clinical testing designed to identify the presence of a specific cancer in an asymptomatic individual or population thought to be at risk of that specific cancer. The intent is to find cancers at the earliest possible stage in their development, in order to improve the chances for disease cure. 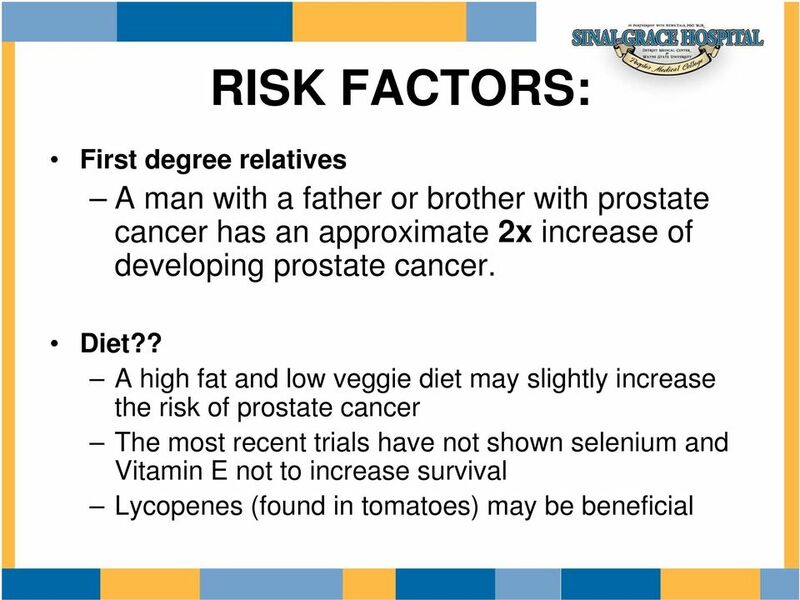 7 PROSTATE CANCER EPIDEMIOLOGY: Prostate cancer is the most common cancer in men and the 2nd most common cause of cancer deaths in men Life time risk for men in the U.S. of getting cancer is one out of six. 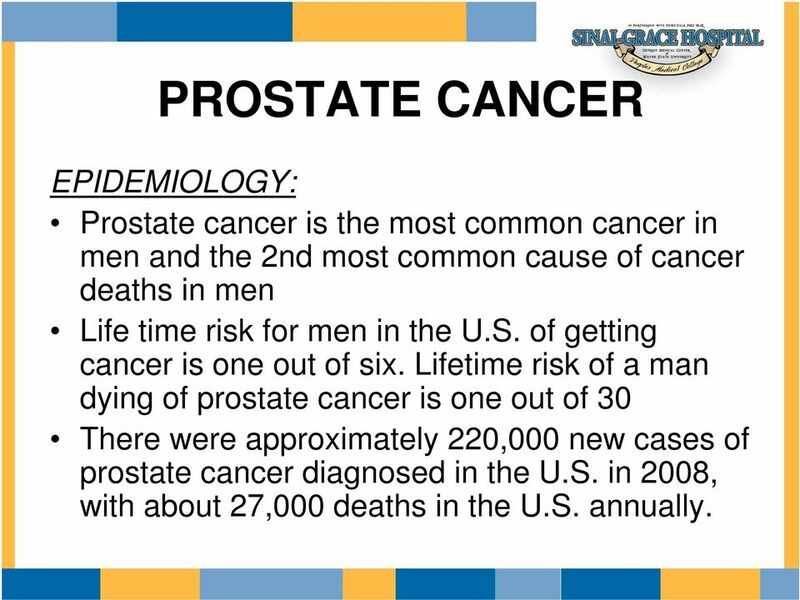 Lifetime risk of a man dying of prostate cancer is one out of 30 There were approximately 220,000 new cases of prostate cancer diagnosed in the U.S. in 2008, with about 27,000 deaths in the U.S. annually. 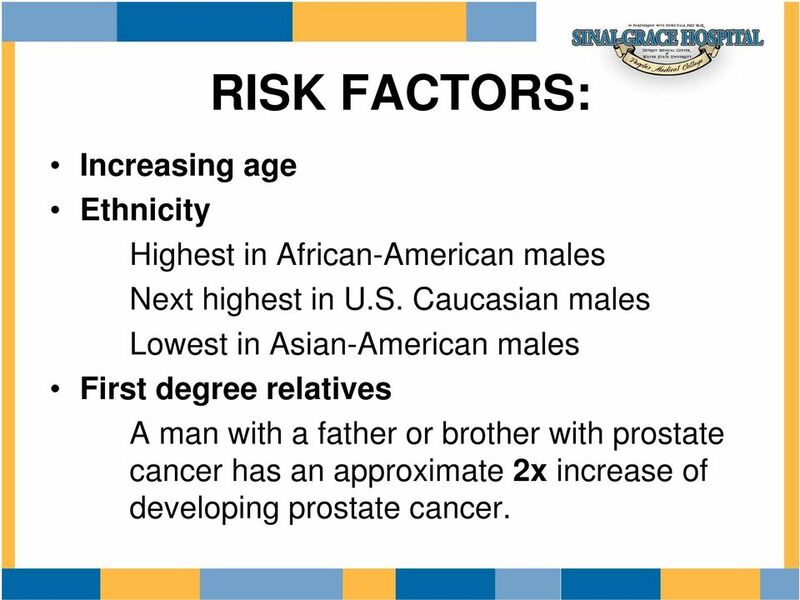 8 Increasing age Ethnicity RISK FACTORS: Highest in African-American males Next highest in U.S. Caucasian males Lowest in Asian-American males First degree relatives A man with a father or brother with prostate cancer has an approximate 2x increase of developing prostate cancer. 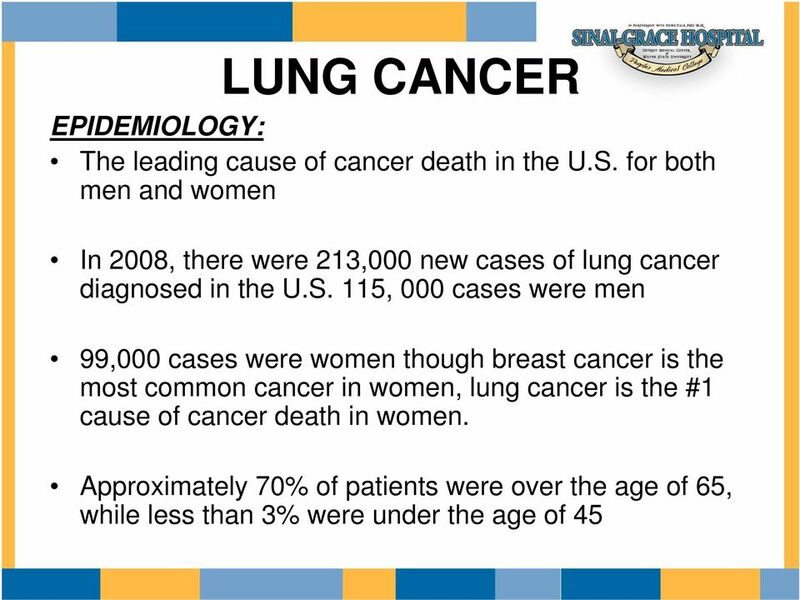 15 LUNG CANCER Overall, this cancer has a very poor prognosis. Only approximately 14% of patients live greater than 5 years. Despite this prognosis, there are long term survivors. Based on cancer registries there are, to date, 330,000 long term survivors. 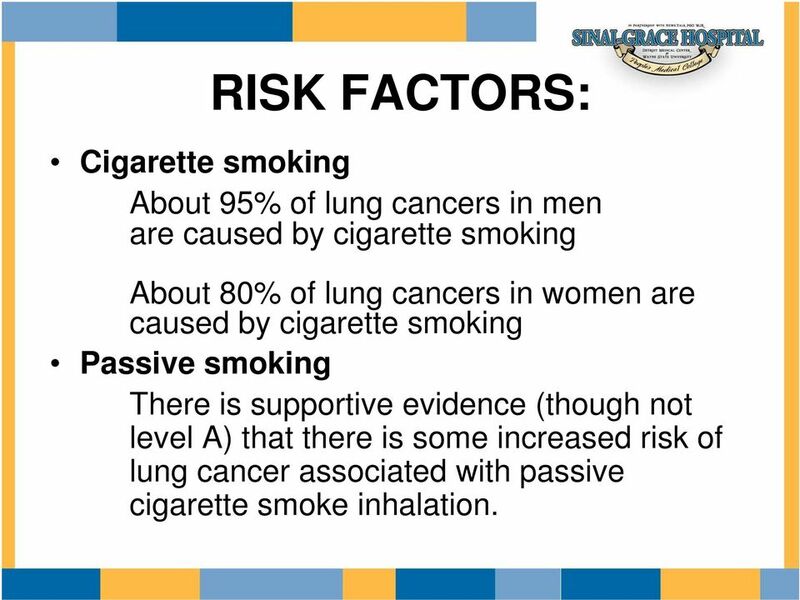 16 RISK FACTORS: Cigarette smoking About 95% of lung cancers in men are caused by cigarette smoking About 80% of lung cancers in women are caused by cigarette smoking Passive smoking There is supportive evidence (though not level A) that there is some increased risk of lung cancer associated with passive cigarette smoke inhalation. 24 Hypertrophic Osteoarthropathy Severe joint and surrounding soft tissue swelling. 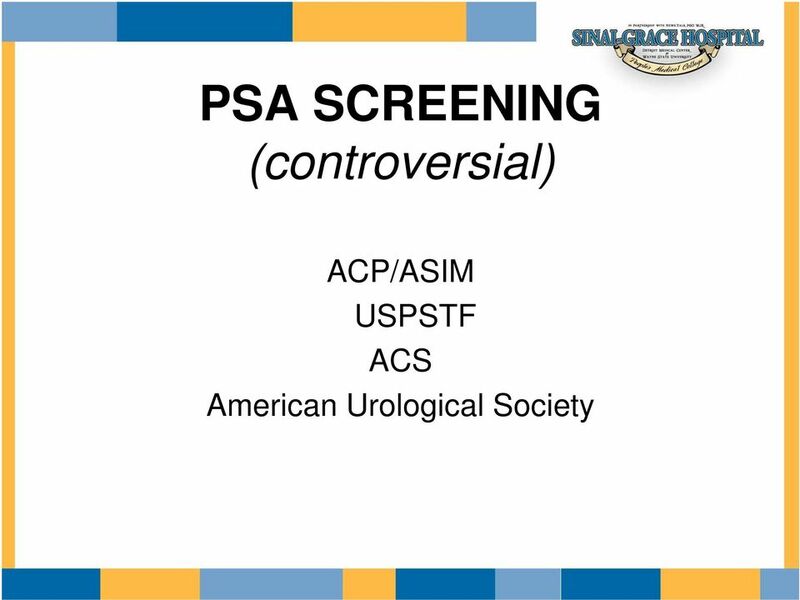 31 Screening Knowing your risks encourages proper screening. Recent recommendations advocating a change in screening to mammograms starting at age 50 and only every 2 years are NOT being adopted by the major organizations involved in breast cancer care. 32 American Cancer Society Breast Cancer Screening Recommendations Yearly mammograms are recommended starting at age 40 and continuing for as long as a woman is in good health. Clinical breast exam (CBE) should be part of a periodic health exam, about every 3 years for women in their 20s and 30s and every year for women 40 and over. Women should know how their breasts normally feel and report any breast change promptly to their health care providers. Breast self-exam (BSE) is an option for women starting in their 20s. 33 American Society of Breast Surgeons The American Society of Breast Surgeons is strongly opposed to the recommendations released November 16, 2009 by the United States Preventive Services Task Force (USPSTF). The Society will continue to advocate for routine annual mammography screening for all women beginning at age 40. Mammography screening reduces breast cancer mortality and saves lives. 44 Colonscopy can actually prevent cancer if polyps are removed that have cancerous potentional. Getting regularly scheduled screening can potentially prevent cancer development or improve survival if diagnosed by catching at an earlier stage. 45 Risk reduction, screening, and survival go hand in hand for breast cancer and colon cancer. 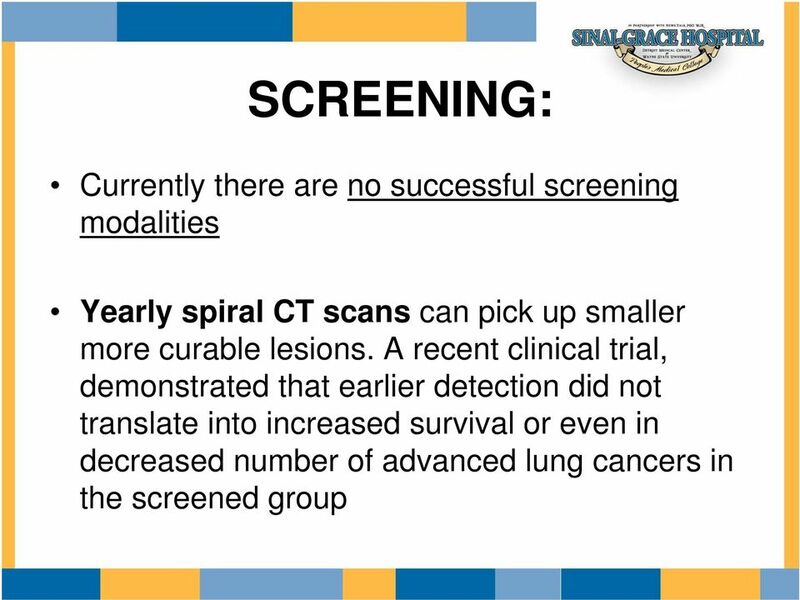 Cancer Screening. 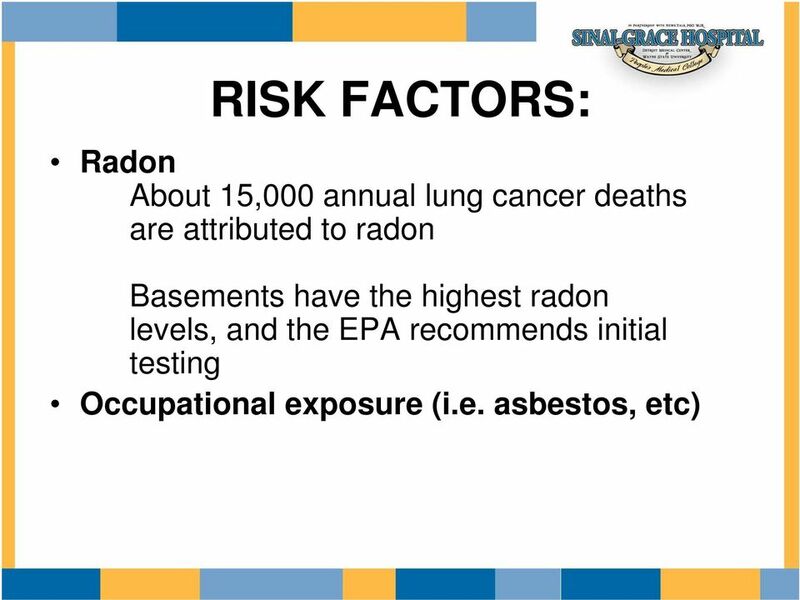 Robert L. Robinson, MD, MS. Ambulatory Conference SIU School of Medicine Department of Internal Medicine. 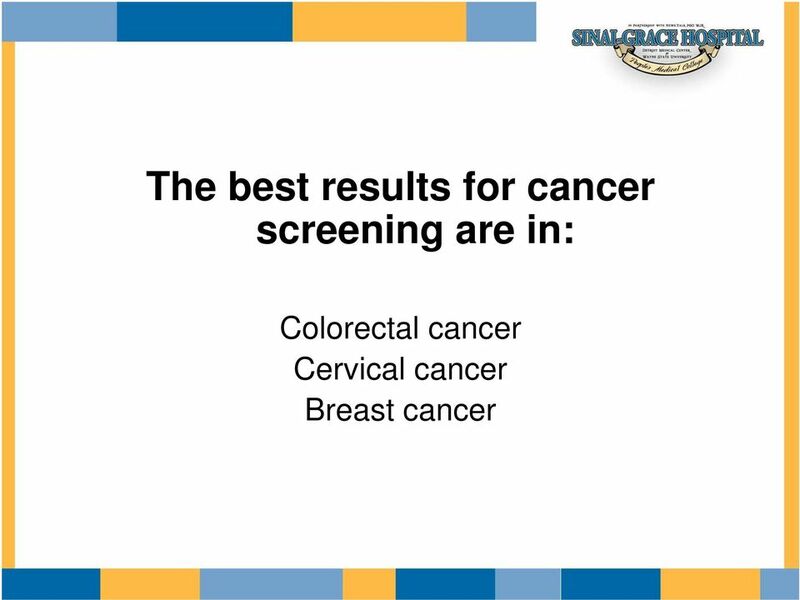 Examples of good screening tests include: mammography for breast cancer screening and Pap smears for cervical cancer screening. 20 MOST FREQUENTLY ASKED QUESTIONS ABOUT COLON CANCER ANSWERED. What causes a polyp to form? 20 MOST FREQUENTLY ASKED QUESTIONS ABOUT COLON CANCER ANSWERED What causes a polyp to form? 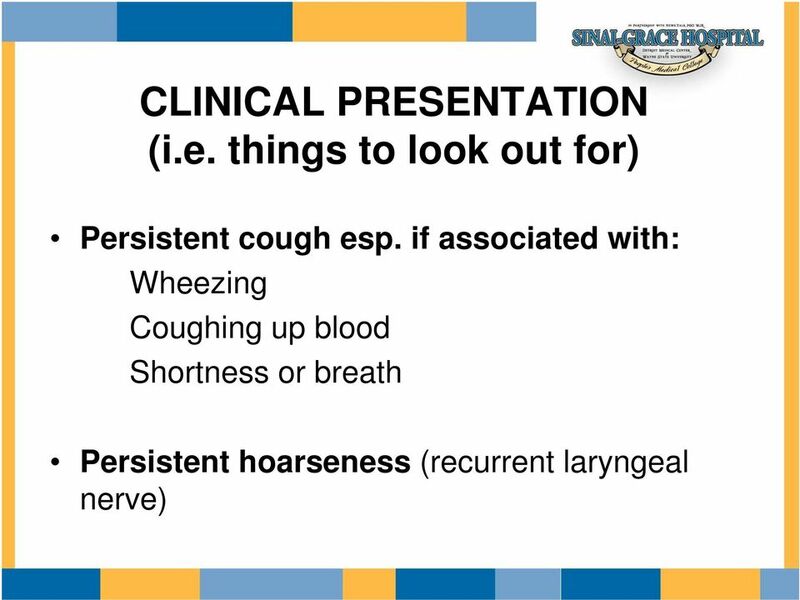 The exact causes of polyps are uncertain, but they appear to be caused by both inherited and lifestyle factors. OVARIAN CANCER IS A MAJOR CAUSE OF MORBIDITY AND MORTALITY IN WOMEN. Name of Student HTHSCI 1110 WEBER STATE UNIVERSITY. Hello. My name is Suzanne Day. I am a nurse practitioner at The University of Texas MD Anderson Cancer Center. I m here today to talk about assessing risk and preventing second primary breast cancers.